I love everything Disney. So if you asked me what my favorite things about Disney are, I’d say everything. But, in this article, I am listing my top five! This is not in order of preference, just my top five. One of my all-time favorite Disney movies is Tangled. I LOVE Rapunzel! She has been my favorite Disney princess since I first saw the movie! I love her long hair that is 70 feet long, and I especially love her cute chameleon, Pascal! 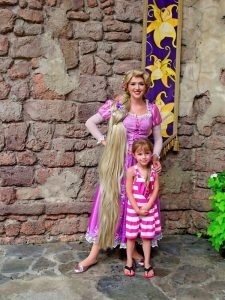 When I was younger, I used to wear my Rapunzel dress-up gown, braid my hair, and tie a jump rope to my braid to make my hair look longer. This princess is even so awesome, she has her own show called Tangled the series on Disney Channel! One of my other favorite top five things about Disney is Fantasyland! I love everything in Fantasyland, Magic Kingdom. I love the dark rides, that make me feel like I am surely in Disney World, and I love the food. For example, Mickey Mouse Ice Cream bars, or popcorn in a Mickey bucket. I also love the rides in Fantasyland that give you a thrilling feeling, such as Goofy’s Barnstormer, and the Mad Hatter Tea Party. I also love the characters in Fantasyland that show you that magic is real. Another thing I love about Disney is World Showcase in Epcot. Epcot has always given me this magical feeling inside, but when I got older I started to understand World Showcase more, and it’s been great ever since then. I love walking through World Showcase and seeing the Disney princesses in their countries and getting my Duffy coloring stamped. It’s just magical and somehow feels like Disney. The fourth thing I love about Disney is the way you never have to grow up or care about what others think of you when you are there. If you are an adult, you can be a kid again. If you are a kid, you don’t have to worry about what others are thinking about you. The only thing you have to care about is having a wonderful time. And only Disney can do that. The last thing I am going to list off in my top five is Disney Channel. I am a Disney Channel addict. I’m pretty sure I know about every Disney Channel show and movie there is! (Starting from 2009 and up.) I even remember the old ones I watched when I was really little like Shake it Up and A.N.T. Farm. Disney Channel is just another one of those things that just adds to the Disney magic and shows how successful Disney really is. Overall, those are my top five favorite Disney things. “That’s the real trouble with the world. Too many people grow up.” -Walt Disney.